Finding a general dentist that can treat every member of your family’s unique smiles can be difficult. At the Fresno family dental practice of Jack Oberti, DDS, we provide an array of preventive treatments to ensure your family has lasting, healthy smiles. 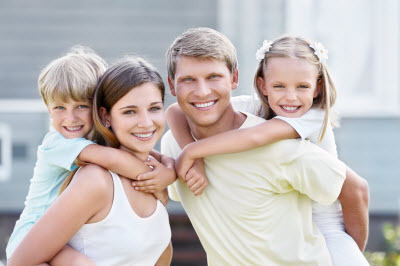 From children’s dental care to restoring missing teeth and restorations, our modern office offers family-focused dentistry.To schedule your family’s next dental visit, contact us today! A healthy smile begins at a young age, and having a positive first experience at the dentist can impact future visits. Our Fresno dentist and compassionate hygienist, Jamie, take the time to ensure our young patients are comfortable in the dentist’s chair. We have found that it’s important to be patient with kids and understand their anxiousness. During visits to our practice, we explain our findings in kid-friendly language and allow them to get associated with being in the chair. Our focus is to keep children free of dental caries and provide treatments that support healthy smiles. We take the time to educate parents on the importance of fluoride, recommending treatments or supplements to offset what isn’t acquired through water. Children’s dental services in Fresno include an in-depth discussion with Dr. Oberti on how to properly care for your child’s smile at home. As our smiles age, it’s important to stay informed on opportunities to ensure they are healthy. By taking the time to visit the dentist for return appointments, patients can prevent dental concerns from progressing into serious issues. Dr. Oberti focuses on determining any necessary dental treatments are taken care of before discussing cosmetic additions to the smile. With in-depth examinations that include oral cancer screenings, gum health checks, and bite analyses, patients can benefit from the thoroughness of our procedures and dedication our Fresno dentist has for his patients. With our dental lab just two doors down, patients can receive necessary dental treatments to restore the health of their smiles as well as pick the shade of their aesthetic crown to complete treatment. Dr. Oberti takes the time to create a treatment plan that targets all your smile needs. We understand that visiting the dentist can be overwhelming for people. This is why we provide nitrous oxide to quell patients’ anxieties and fears. Our staff is committed to providing every patient the necessary care they need with a focus on ensuring your comfort throughout the appointment. Family dental care is done by a compassionate Fresno dental team. Whether you’re looking to replace missing teeth or just to ensure gums are healthy, our Fresno family practice has the dental services for you. Dr. Jack Oberti provides comprehensive family dentistry in Fresno. For more information about our general, cosmetic, and children-focused dental treatments, contact us today to schedule an appointment!